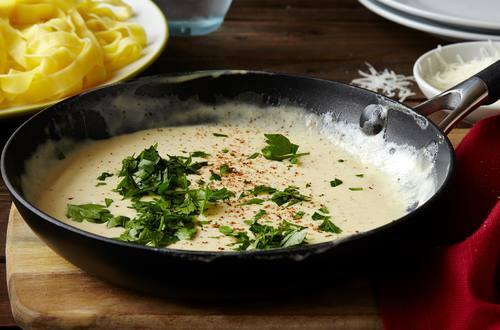 Creamy Hellmann's® or Best Foods® Real Mayonnaise, nutmeg and Parmesan make this the perfect, deliciously rich Alfredo sauce recipe. 1 Melt Country Crock® Spread in small skillet over low heat, then add heavy cream, Hellmann's® or Best Foods® Real Mayonnaise and nutmeg. Cook, stirring frequently, over low heat, until warm, about 6 minutes. Stir in 1-1/4 cups cheese until melted. 2 Serve, if desired, over hot cooked pasta, adding hot pasta water if needed to thin to desired consistency. Garnish with remaining 1/4 cup cheese and, if desired, with chopped parsley and additional ground nutmeg. Also delicious served over hot cooked chicken breasts!